Pour beans in 8"x8" casserole dish. In a small bowl, combine remaining ingredients and pour over beans. Cover and place in oven. Bake for 90 mins. stirring 2-3 times. At the young age of 29, I was diagnosed with congestive heart failure due to a congenital heart defect. The ultimate solution to my problem would be heart transplant but doctors did not know when. Breaking the salt habit was simply not an option. It was a matter of life and death. While highly motivated to succeed, the prescribed dietary changes required significant changes in my existing lifestyle. Initially, this meant giving up all of the popular foods I was used to enjoying. 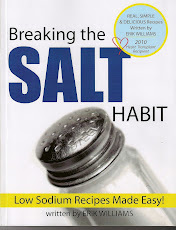 However, after growing bored with the limited meals that conformed to my dietary restrictions, I began researching and modifying popular recipes I could now enjoy in a low sodium lifestyle. What type of low-sodium recipes would you like to see?